Need More Space? We are your solution! We Sell Boxes and Moving Supplies. Ashland Simply Storage is conveniently located off S Washington Highway, with easy access to I-95. We are just between England Street and Ashland Road and we proudly serve many communities in the greater Richmond, VA area. 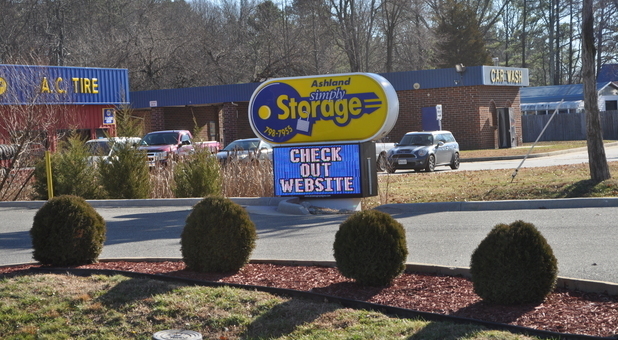 If you live or work in Glen Allen, Richmond, Wyndham, Ashland, Hanover, or any number of the nearby neighborhoods, our storage facility is in a perfect location for you. You may have passed us on your way to Randolph-Macon College or the North Ashland Plaza Shopping Center, as we are just about a mile south of each! When you think of renting a storage unit, we hope that a pleasant experience comes to mind. Each and every one of our professional staff members believes that storage should be simple – and that’s what you’ll find with us! From new specials every month to convenient drive-up access, we enjoy delivering the best facility around. Check out our wide range of unit sizes and determine which one best suits your needs. If you need help along the way, don’t hesitate to ask; we are more than happy to serve you in any way we can. Are you concerned about the safety of your belongings? Worry no longer! We offer insurance for your valuables and we secure our entire facility with computerized gates and plenty of bright lights. One thing that our customers love most about us is the free move-in truck we provide – no matter which unit size you choose. And before you go running around town looking for used boxes, let us make your day easier with our shop full of moving and packing supplies! Get organized. Spring is almost here! Everyone was nice and it was convenient. Great. Definitely will recommend. Very friendly staff. Place is really clean, easy to get to. Staff very nice and friendly. Painless. A good choice for temporary storage needs.